Brooks & Dunn will be the newest inductees into the Country Music Hall of Fame in the Modern Era. This was the news coming out of the press conference held Monday morning (3-18) in the Hall of Fame rotunda in Nashville. WSM broadcaster Bill Cody made the announcement, filling in for an ailing Reba McEntire. The other 2019 inductees announced were Ray Stevens in the Veterans Era category, and Jerry Bradley in the Non Performer Category, joining his father Owen Bradley and uncle Harold Bradley as Hall of Fame inductees. “It’s beyond an honor to be here, it hasn’t soaked into me, and it probably will at some time when I’m off by myself, I’ll have an emotional moment for sure,” Ronnie Dunn said to the assembled crowd. Brooks & Dunn was a commercial powerhouse duo in the 90’s if there ever was one, and is the most commercially successful and award decorated country music duo of the modern era. The pair’s first album Brand New Man sold 6 million copies, and they won the CMA for Vocal Duo of the Year every year but one between 1992 and 2006—a historic feat. In between then they also racked up 20 #1 singles, including widely-recognized standards of country music such as “Brand New Man,” “Neon Moon,” “My Maria” written by B.W. Stevenson that went on to be the biggest song in all of country in 1996, and “Ain’t Nothing ‘Bout You” that was the biggest song in 2001. They also had 19 more Top 10 singles. Both Kix Brooks and Ronnie Dunn were vocalists and songwriters signed to labels and had charting singles before officially forming the duo in 1990. Kix Brooks had also written #1 songs for the Nitty Gritty Dirt Band and Highway 101 among others. By 1991 they were signed to Arista Nashville, and quickly took advantage of the vacancy of a major country music duo as the genre’s “Class of ’89” (Garth Brooks, Clint Black, Alan Jackson, Travis Tritt) took country music to new commercial heights. Eight of the duo’s 10 studio records are Certified Platinum or better. The success of Brooks & Dunn is not debatable, but the name is often brought up as an example of a label project that had lots of hits, but questionable influence beyond the charts. Often the contributions of Brooks & Dunn is overshadowed by the more overwhelming success of Garth Brooks and the other members of the Class of ’89. What likely helped the duo in Hall of Fame consideration is Kix Brooks’ recent efforts on syndicated radio with a countdown show has kept him in the public eye and close to the industry. Ronnie Dunn has launched a solo recording career. Brooks & Dunn will also receive an additional boost this year from their Reboot project pairing them with a bunch of today’s stars in re-recordings of some of their biggest hits. This likely helped put their name and legacy back in front of Hall of Fame voters right as final ballots were being cast. They were already set to receive a dedicated exhibit in the Hall museum come August. Brooks & Dunn officially disbanded in 2010, but reunited in 2015 to play shows opening for Reba McEntire, and now make appearances together on a semi-regular basis. The duo will be officially inducted into the Hall of Fame later in 2018 in the annual Medallion Ceremony. I think we all kind of expected them to get inducted today. Was anyone expecting Ray Stevens? I’m going to have a LOT to say about the Ray Stevens induction momentarily. No. Nobody was expecting Ray Stevens. Is this the Ray Stevens that did “The Streak”? He did some amusing songs but nothing I would call Hall of Fame material. I suppose there is some other stuff he did that I don’t know about? It is. There’s a lot of material from him, but his comedy stuff is the bulk of it. I don’t really get how he is more worthy than Johnny Horton, or many others who were much purer country. This is why Ray got in. This is what he’s capable of. 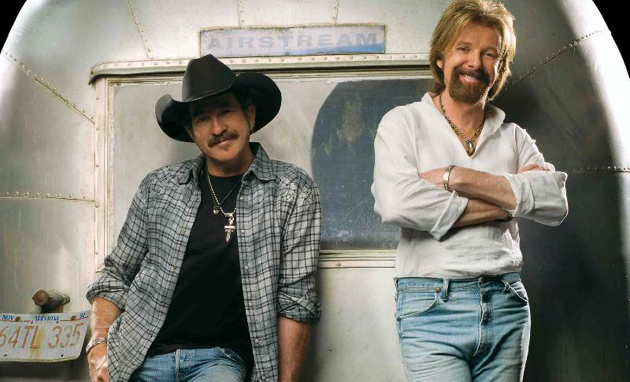 A major Super Big Congrats to Brooks and Dunn for this Country Music Hall of Fame achievement. Given their overall chart action, radio airplay, and sales, I believe it is well deserved. As for the “Reboot” album (CD) coming out next week, I’d prefer to listen to the original recordings. However I hope the album does well in introducing new listeners to their songs and maybe those folks will dig back into the original Greatest Hits albums and more. I think the general idea is to interest younger listeners in older songs, as you imply. Bringing in a hot name is simply to garner attention and make it palatable for certain ears. Unlike some others, I’m not sure I really mind an artist I like cavorting with “the enemy,” as it were. After all, just because we (or they) don’t like someone’s music doesn’t mean that those people deserve denigration as human beings right to their faces. Also, younger people are mostly uninterested in older things, be it art or otherwise. It was true in 1950 and it’s true now. This could be a gateway drug for that FGL or Kane Brown fan that doesn’t know they also like more traditional country music because they’ve never tried it. And as much as I would swear by many older records I’d put on the spot, almost no teenagers in 2019 are going out and picking up Merle Haggard (etc.) records. You have to be led there somehow, be it by the radio when classic country was famous, your parents, or an older artist chumming it up with a hot name. I can’t tell you how many times I’ve read something along the lines of “______ got me into country music” (generally a modern act like Garth or B&D). It’s unfortunate, but that’s the way it is. For my money Boot Scootin Boogie was their best. One of the better suburban acts. Well deserved for Brooks and Dunn! Reba must be pretty sick, she’s canceled concerts and now to miss this. Ray Stevens is an interesting choice. Reba is close to Brooks & Dunn as well. I’m sure she really wanted to be there. Now here’s hoping Dwight Yoakam gets in next year. He definitely deserves to be there. Yoakam definitely moves into the catbird seat. I expect him to be in within the next two, maybe three years max. After the initial Brooks / Dunn divorce, there was a songwriters show in my area, w/ Kix and a couple of other folks, but not Dunn. Kix told a story about how B & D phoned John Rich after Pres. Obama used the same B & D song as [the equivalent to walk up music in baseball] that Pres. GWB had done. Kix whimsically implied that Rich was angry / frustrated about B & D’s universal appeal across the political and social spectrums in contrast to Big and Rich’s lack of same. The best part of B & D joining the country HOF will be that they will be able to frustrate John Rich again. Yes, clearly the best part of a wonderful act from country music’s past being honored with an induction that few will ever get is that it’ll frustrate one man from another duo that hasn’t been relevant to most listeners for a decade. Congratulations to all the inductees. They deserve this. Now do Hank Williams Jr, because WTF already? Years ago, I’d join my friends at the local country bar, where “Neon Moon” and “Boot Scootin Boogie” would always play. And when I hear Neon Moon, I always think of the people I hung out with (some of whom have passed away, some have moved away). These guys were country. And this honor is well deserved. Annoyed about the people not voted in though. How do you bypass Dwight Yoakam? Yoakam ought to have been inducted in a looooong time ago. What the hell happened? There’s a lot of competition. They only bring in one contemporary artist a year. Nothing against Brooks & Dunn, but I was rooting for others. if it hadn’t been for ” Brooks and Dunn ” we may never have been introduced to one of the best voices to ever wrap itself around a country song ….Ronnie Dunn . For my money , that’s reason enough to ‘ reboot ‘ , induct , celebrate, remember and remind listeners once again about HOW a REAL country singer can move us with a vocal performance . Listen to ” The Cost Of Living ” and tell me Ronnie doesn’t belong up there with George J , Joe Nichols or Merle in the way he feels and delivers a performance of a REAL country song . Hall of fame indeed …..
Good pick. Obviously it’s a crowded field and everybody has their favorites, but I can’t see anyone having a problem with it other than the two guys who are pissed off that they got in before the Kendalls. I’m really not that surprised by Ray Stevens. Not saying I think he’s the most deserving artist waiting in the wings in the veterans’ category, but he has some things in his favor that voters tend to like. At this point, the Country Music Hall of Fame and Museum is a joke. Ray Stevens is a great guy, but he’s a comedian. His accomplishments are insignificant compared to Hank William Jr.’s accomplishments – commercially or artisically. Brooks and Dunn are fantastic, but they don’t belong in before Hank. The HOF has intentionally pushed Hank into the cluttered Veteran category – hopelessly backlogged with deserving artists; but none more deserving than Hank Williams Jr. At this point, voters are intentionally ignoring Hank’s accomplishments and his undeniable impact on the genre. #BocephusBelongs! Congratulations to Ronnie Dunn. Kix is blessed to be part of the ride. Without Dunn’s voice, no B&D. Doesn’t matter. We all know that without Dunn’s voice, B&D would not be. Now, Kix is surely talented. Yes, he sang lead on a couple of hits. A songwriter as well. It is not a statement against him as much as against the whole duo crap. I have never been a fan if duo awards anyway. It was just too narrow a field at the awards shows. After B&D, then Sugarland. Really? A smiling beanie-wearing goggle-eyed guy strumming a whatever looking at Nettles as she sang made this duo. Really? When you can never pick out the singing partner, back-up, of a duo, then there isn’t one. For example, listen to the Bellamy Brothers, The Louvin Brothers, The Kendalls (take note Sugarland), The Wreckers, Sweethearts of the Rodeo, The Judds (representing the females, don’t want to leave them out for fear of a lawsuit), and even Big & Rich among many others. Yes, one voice is dominate in these duos but at least you can easily pick out the second person. Not so with B&D. So yes, my comment still stands. Ronnie could have been a duo with anyone and they would have done well. And I do feel they are deserving of the award, though like most, would have liked others before them. And until artists like Hank Jr. are admitted in, the legitimacy of the HOF is in question. Shouldn’t have an ounce of internal political persuasion, but alas, the world we live in today. Haha. Correct. And that is what I am saying. This could also be said for that God-awful Sugarland duo. However, for the examples I listed above, the same cannot be said and that is why they are REAL duo’s in my opinion. I mean, compare the Kendalls to Sugarland. Both are a male/female duo. Aside from the fact that Jeannie Kendall can actually sing as compared to Nettle’s whining voice that is worse than fingernails on a chalkboard, just listen and compare the two. Uh, no comparison. I am not saying duos should be a carbon copy of others, but if you cannot hear the distinctive voice of the second partner in a duo on a regular basis, they “ain’t” one. Most of the time when Kix comes in to sing on the chorus there are other backup singers as well. It masks his voice to where you can’t hear him. Maybe that was the purpose! A comment on a previous post stated something like, “But the other partner writes songs so that makes them a duo.” Heck, if that is the case, then most solo artists should be considered a duo with the writer of their material. Doesn’t hold water. Brooks & Dunn is pretty much an automatic selection. They dominated the mainstream for 2+ decades. And “Brand New Man” is a honky tonk masterpiece. B&D are amazing and Ronnie Dunn is a country god. Well deserved. At least the voters picked them over Chesney so let’s consider that a win. I think The Judds, Dwight, Hank Jr. and Tanya Tucker need to be included in the future classes. When will the CMA change their rule and allow more than three each year? Tanya is one of most deserving of this honor but is passed over repeatedly. Seems the HOF treats women much like country radio does. Sorry but we can’t seem to squeeze you in. Brooks & Dunn – the soundtrack of my youth; now a guilty pleasure. The only problem with Hank Jr. is he’ll have to say something – a speech – about his induction. He’s a loose cannon (remember he called Obama a Muslim and Hitler?) Sadly, he’s not going in while he’s alive (not in this political environment). Their influence on country as well as the staying power of the songs make B&D a good pick to me. Here’s hoping Dwight & Hank get their day in the hall of fame soon though. Not a surprise pick, and given the popularity of their music at the time, a good selection from the HOF perspective. But I completely fail to see how Brooks and Dunn fit into the camp of traditional country music at all. Neon Moon is one of my all-time favorite songs. Congrats guys!